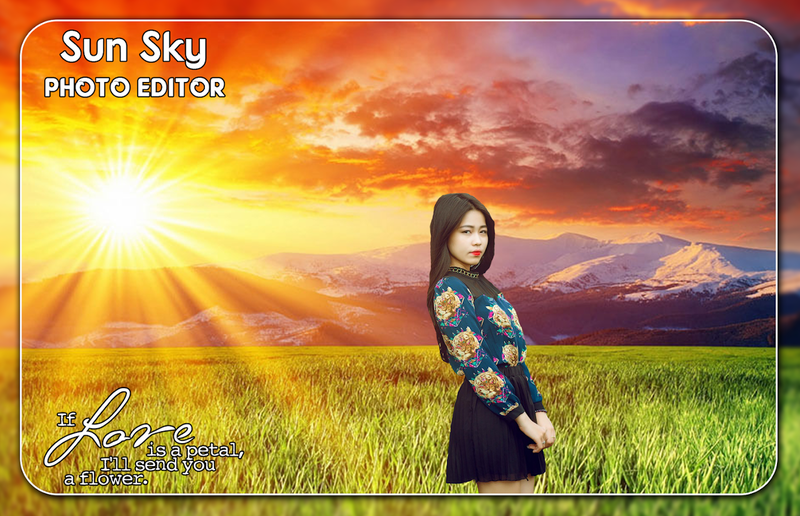 Beautiful and stylist HD sun sky Photo Editor just for you.With sunsky Photo Frames, you can add a sun sky frames to your favoritephotos of the friends and family, any picture will be perfect!Wouldyou like your pictures to be appearing in the beautiful sun skyframe? These fantasy frames are ideal for you to frame yourmemories and make them unforgettable. Using this app you can makephotos more beautiful by decorating them with fantastic free sunsky photo frame, effects, text and stickers. ✿✿Make your photoBeautiful photos with Editor photo frame. It contain sun sky HDframes, sun sky Beautiful high resolution frames. There are lots ofeffects are available to make your photo beautiful. Enjoy it.✧sunsky Photo Editor ✧ are a great way to display photos of happymemories. This is awesome way to say ‘Marry sun sky’. Select one ofthe photo frame templates and start photo editing. This free photoeditor offers you square frames, polygon frames, circle frames,heart frames, star frames and more photo frames of different sizesand shapes inspired with sun sky. The warmth of sun sky time spentwith friends and loved ones is so enjoyable that the memories beingcreated and captured with photos will inspire you throughout thefollowing year. _How to Use_☆Select your Favourite photo fromGallery or Camera.☆Choose frame according to your photo.☆Share yourcreations with friends.sun sky photo Editor provide a means ofdisplaying numerous pictures in an aesthetically pleasing way. Witha range of colors and styles to choose from, it is easy to find a“photo frame” & “photo editor”to suit your screen and sun skyatmosphere. Key Features- Beautiful and stylist HD sun sky PhotoEditor just for you.- Select a photo or picture from gallery orcapture it with your camera phone in real time.- You can Rotate,scale, zoom in, zoom out or drag the photo to fit the frame as youlike- Give different effects to your photos with sun sky PhotoFrames app.- Give different effects to your photo.- Dynamicadjustment of grid size- Lots of backgrounds and stickers to choosefrom!- Save your collage or edited photos.- Nice and colorfulstickers.- Photo Frame is an a great collage maker and photoeditor!- Add multi photo with in single photo frame.- Multiplestylish sun sky photo editor for any picture.- amazing magicaleffects to apply on photo.- Save your image to SD card.- Share yourcreation via social media.- Add Text with different color , fontspattern and resize your text.- A lot of sun sky templates to choosefrom, fit for any occasion.- Easy to add TEXT or STICKERS!- Pickthe photo frame you like best;- Make your photo more effective andcreative with unique shapes.- Stitch pics together within a fewtaps!- Multi frame pic sun sky for use chooseEnjoy This sun skyPhoto EditorPlease don’t forget to write your opinion if your likeour creation. Beautiful and stylist HD ram navami Photo Editor just for you.Withram navami Photo Frames, you can add a ram navami frames to yourfavorite photos of the friends and family, any picture will beperfect!Would you like your pictures to be appearing in thebeautiful ram navami frame? These fantasy frames are ideal for youto frame your memories and make them unforgettable. Using this appyou can make photos more beautiful by decorating them withfantastic free ram navami photo frame, effects, text and stickers.✿✿Make your photo Beautiful photos with Editor photo frame. Itcontain ram navami HD frames, ram navami Beautiful high resolutionframes. There are lots of effects are available to make your photobeautiful. Enjoy it.✧ram navami Photo Editor ✧ are a great way todisplay photos of happy memories. This is awesome way to say ‘Marryram navami’. Select one of the photo frame templates and startphoto editing. This free photo editor offers you square frames,polygon frames, circle frames, heart frames, star frames and morephoto frames of different sizes and shapes inspired with ramnavami. The warmth of ram navami time spent with friends and lovedones is so enjoyable that the memories being created and capturedwith photos will inspire you throughout the following year. _How toUse_☆Select your Favourite photo from Gallery or Camera.☆Chooseframe according to your photo.☆Share your creations withfriends.ram navami photo Editor provide a means of displayingnumerous pictures in an aesthetically pleasing way. With a range ofcolors and styles to choose from, it is easy to find a “photoframe” & “photo editor”to suit your screen and ram navamiatmosphere. Key Features- Beautiful and stylist HD ram navami PhotoEditor just for you.- Select a photo or picture from gallery orcapture it with your camera phone in real time.- You can Rotate,scale, zoom in, zoom out or drag the photo to fit the frame as youlike- Give different effects to your photos with ram navami PhotoFrames app.- Give different effects to your photo.- Dynamicadjustment of grid size- Lots of backgrounds and stickers to choosefrom!- Save your collage or edited photos.- Nice and colorfulstickers.- Photo Frame is an a great collage maker and photoeditor!- Add multi photo with in single photo frame.- Multiplestylish ram navami photo editor for any picture.- amazing magicaleffects to apply on photo.- Save your image to SD card.- Share yourcreation via social media.- Add Text with different color , fontspattern and resize your text.- A lot of ram navami templates tochoose from, fit for any occasion.- Easy to add TEXT or STICKERS!-Pick the photo frame you like best;- Make your photo more effectiveand creative with unique shapes.- Stitch pics together within a fewtaps!- Multi frame pic ram navami for use chooseEnjoy This ramnavami Photo EditorPlease don’t forget to write your opinion ifyour like our creation. Beautiful and stylist HD love heart Photo Editor just for you.Withlove heart Photo Frames, you can add a love heart frames to yourfavorite photos of the friends and family, any picture will beperfect!Would you like your pictures to be appearing in thebeautiful love heart frame? These fantasy frames are ideal for youto frame your memories and make them unforgettable. Using this appyou can make photos more beautiful by decorating them withfantastic free love heart photo frame, effects, text and stickers.✿✿Make your photo Beautiful photos with Editor photo frame. Itcontain love heart HD frames, love heart Beautiful high resolutionframes. There are lots of effects are available to make your photobeautiful. Enjoy it.✧love heart Photo Editor ✧ are a great way todisplay photos of happy memories. This is awesome way to say ‘Marrylove heart’. Select one of the photo frame templates and startphoto editing. This free photo editor offers you square frames,polygon frames, circle frames, heart frames, star frames and morephoto frames of different sizes and shapes inspired with loveheart. The warmth of love heart time spent with friends and lovedones is so enjoyable that the memories being created and capturedwith photos will inspire you throughout the following year. _How toUse_☆Select your Favourite photo from Gallery or Camera.☆Chooseframe according to your photo.☆Share your creations withfriends.love heart photo Editor provide a means of displayingnumerous pictures in an aesthetically pleasing way. With a range ofcolors and styles to choose from, it is easy to find a “photoframe” & “photo editor”to suit your screen and love heartatmosphere. Key Features- Beautiful and stylist HD love heart PhotoEditor just for you.- Select a photo or picture from gallery orcapture it with your camera phone in real time.- You can Rotate,scale, zoom in, zoom out or drag the photo to fit the frame as youlike- Give different effects to your photos with love heart PhotoFrames app.- Give different effects to your photo.- Dynamicadjustment of grid size- Lots of backgrounds and stickers to choosefrom!- Save your collage or edited photos.- Nice and colorfulstickers.- Photo Frame is an a great collage maker and photoeditor!- Add multi photo with in single photo frame.- Multiplestylish love heart photo editor for any picture.- amazing magicaleffects to apply on photo.- Save your image to SD card.- Share yourcreation via social media.- Add Text with different color , fontspattern and resize your text.- A lot of love heart templates tochoose from, fit for any occasion.- Easy to add TEXT or STICKERS!-Pick the photo frame you like best;- Make your photo more effectiveand creative with unique shapes.- Stitch pics together within a fewtaps!- Multi frame pic love heart for use chooseEnjoy This loveheart Photo EditorPlease don’t forget to write your opinion if yourlike our creation. Beautiful and stylist HD love birds Photo Editor just for you.Withlove birds Photo Frames, you can add a love birds frames to yourfavorite photos of the friends and family, any picture will beperfect!Would you like your pictures to be appearing in thebeautiful love birds frame? These fantasy frames are ideal for youto frame your memories and make them unforgettable. Using this appyou can make photos more beautiful by decorating them withfantastic free love birds photo frame, effects, text and stickers.✿✿Make your photo Beautiful photos with Editor photo frame. Itcontain love birds HD frames, love birds Beautiful high resolutionframes. There are lots of effects are available to make your photobeautiful. Enjoy it.✧love birds Photo Editor ✧ are a great way todisplay photos of happy memories. This is awesome way to say ‘Marrylove birds’. Select one of the photo frame templates and startphoto editing. This free photo editor offers you square frames,polygon frames, circle frames, heart frames, star frames and morephoto frames of different sizes and shapes inspired with lovebirds. The warmth of love birds time spent with friends and lovedones is so enjoyable that the memories being created and capturedwith photos will inspire you throughout the following year. _How toUse_☆Select your Favourite photo from Gallery or Camera.☆Chooseframe according to your photo.☆Share your creations withfriends.love birds photo Editor provide a means of displayingnumerous pictures in an aesthetically pleasing way. With a range ofcolors and styles to choose from, it is easy to find a “photoframe” & “photo editor”to suit your screen and love birdsatmosphere. Key Features- Beautiful and stylist HD love birds PhotoEditor just for you.- Select a photo or picture from gallery orcapture it with your camera phone in real time.- You can Rotate,scale, zoom in, zoom out or drag the photo to fit the frame as youlike- Give different effects to your photos with love birds PhotoFrames app.- Give different effects to your photo.- Dynamicadjustment of grid size- Lots of backgrounds and stickers to choosefrom!- Save your collage or edited photos.- Nice and colorfulstickers.- Photo Frame is an a great collage maker and photoeditor!- Add multi photo with in single photo frame.- Multiplestylish love birds photo editor for any picture.- amazing magicaleffects to apply on photo.- Save your image to SD card.- Share yourcreation via social media.- Add Text with different color , fontspattern and resize your text.- A lot of love birds templates tochoose from, fit for any occasion.- Easy to add TEXT or STICKERS!-Pick the photo frame you like best;- Make your photo more effectiveand creative with unique shapes.- Stitch pics together within a fewtaps!- Multi frame pic love birds for use chooseEnjoy This lovebirds Photo EditorPlease don’t forget to write your opinion if yourlike our creation. Beautiful and stylist HD bridge Photo Editor just for you.Withbridge Photo Frames, you can add a bridge frames to your favoritephotos of the friends and family, any picture will be perfect!Wouldyou like your pictures to be appearing in the beautiful bridgeframe? These fantasy frames are ideal for you to frame yourmemories and make them unforgettable. Using this app you can makephotos more beautiful by decorating them with fantastic free bridgephoto frame, effects, text and stickers. ✿✿Make your photoBeautiful photos with Editor photo frame. It contain bridge HDframes, bridge Beautiful high resolution frames. There are lots ofeffects are available to make your photo beautiful. Enjoyit.✧bridge Photo Editor ✧ are a great way to display photos ofhappy memories. This is awesome way to say ‘Marry bridge’. Selectone of the photo frame templates and start photo editing. This freephoto editor offers you square frames, polygon frames, circleframes, heart frames, star frames and more photo frames ofdifferent sizes and shapes inspired with bridge. The warmth ofbridge time spent with friends and loved ones is so enjoyable thatthe memories being created and captured with photos will inspireyou throughout the following year. _How to Use_☆Select yourFavourite photo from Gallery or Camera.☆Choose frame according toyour photo.☆Share your creations with friends.bridge photo Editorprovide a means of displaying numerous pictures in an aestheticallypleasing way. With a range of colors and styles to choose from, itis easy to find a “photo frame” & “photo editor”to suit yourscreen and bridge atmosphere. Key Features- Beautiful and stylistHD bridge Photo Editor just for you.- Select a photo or picturefrom gallery or capture it with your camera phone in real time.-You can Rotate, scale, zoom in, zoom out or drag the photo to fitthe frame as you like- Give different effects to your photos withbridge Photo Frames app.- Give different effects to your photo.-Dynamic adjustment of grid size- Lots of backgrounds and stickersto choose from!- Save your collage or edited photos.- Nice andcolorful stickers.- Photo Frame is an a great collage maker andphoto editor!- Add multi photo with in single photo frame.-Multiple stylish bridge photo editor for any picture.- amazingmagical effects to apply on photo.- Save your image to SD card.-Share your creation via social media.- Add Text with differentcolor , fonts pattern and resize your text.- A lot of bridgetemplates to choose from, fit for any occasion.- Easy to add TEXTor STICKERS!- Pick the photo frame you like best;- Make your photomore effective and creative with unique shapes.- Stitch picstogether within a few taps!- Multi frame pic bridge for usechooseEnjoy This bridge Photo EditorPlease don’t forget to writeyour opinion if your like our creation. Beautiful and stylist HD 3D Photo Editor just for you.With 3D PhotoFrames, you can add a 3D frames to your favorite photos of thefriends and family, any picture will be perfect!Would you like yourpictures to be appearing in the beautiful 3D frame? These fantasyframes are ideal for you to frame your memories and make themunforgettable. Using this app you can make photos more beautiful bydecorating them with fantastic free 3D photo frame, effects, textand stickers. ✿✿Make your photo Beautiful photos with Editor photoframe. It contain 3D HD frames, 3D Beautiful high resolutionframes. There are lots of effects are available to make your photobeautiful. Enjoy it.✧3D Photo Editor ✧ are a great way to displayphotos of happy memories. This is awesome way to say ‘Marry 3D’.Select one of the photo frame templates and start photo editing.This free photo editor offers you square frames, polygon frames,circle frames, heart frames, star frames and more photo frames ofdifferent sizes and shapes inspired with 3D. The warmth of 3D timespent with friends and loved ones is so enjoyable that the memoriesbeing created and captured with photos will inspire you throughoutthe following year. _How to Use_☆Select your Favourite photo fromGallery or Camera.☆Choose frame according to your photo.☆Share yourcreations with friends.3D photo Editor provide a means ofdisplaying numerous pictures in an aesthetically pleasing way. Witha range of colors and styles to choose from, it is easy to find a“photo frame” & “photo editor”to suit your screen and 3Datmosphere. Key Features- Beautiful and stylist HD 3D Photo Editorjust for you.- Select a photo or picture from gallery or capture itwith your camera phone in real time.- You can Rotate, scale, zoomin, zoom out or drag the photo to fit the frame as you like- Givedifferent effects to your photos with 3D Photo Frames app.- Givedifferent effects to your photo.- Dynamic adjustment of grid size-Lots of backgrounds and stickers to choose from!- Save your collageor edited photos.- Nice and colorful stickers.- Photo Frame is an agreat collage maker and photo editor!- Add multi photo with insingle photo frame.- Multiple stylish 3D photo editor for anypicture.- amazing magical effects to apply on photo.- Save yourimage to SD card.- Share your creation via social media.- Add Textwith different color , fonts pattern and resize your text.- A lotof 3D templates to choose from, fit for any occasion.- Easy to addTEXT or STICKERS!- Pick the photo frame you like best;- Make yourphoto more effective and creative with unique shapes.- Stitch picstogether within a few taps!- Multi frame pic 3D for use chooseEnjoyThis 3D Photo EditorPlease don’t forget to write your opinion ifyour like our creation. Romantic Love Photo Frames Apply beautiful and Romantic love photoframes to your photos, create memorable photo albums and share inonline platforms.. Make your love more romantic and creative withthis Photo frames. "Romantic Love Photo frames" is a collection ofover 30 single and double Photo frames, Stickers and Boarders. Wecan add the text also with customized fonts and colors. Aftercreates the photo album with love photo frames, we can save theimage and send through online..
Jay Bhim Photo Editor is nice app that lets you customize yourphotos. Jay Bhim Photo frame is nice app that lets you customizeyour photos. Choose a photo from your gallery or take it with thecamera of your device, select a frame and generate your photo.Would you like your pictures to be appearing in the beautiful JayBhim frame? These fantasy frames are ideal for you to frame yourmemories and make them unforgettable. Using this app you can makephotos more beautiful by decorating them with fantastic free JayBhim photo frame, effects, text and stickers. Select any photo fromGallery and embed the photo of your choice into Jay Bhim Photolike,. You can use two finger gestures to enter the photo in rightplace in the famous frames.This frames is most blur and cute imagesadd to this app. Jay Bhim Photo Frame save your special momentswith fantastic Jay Bhim photo editor and enjoy beautiful colors ofyour favorite season.Jay Bhim Photo Frame add some of the mostbeautiful camera photo effects to show your creativity and beautifyall the fantastic moments in your life to make you never forgetthem.How to Use Jay Bhim Photo Editor?Select your Favourite photofrom Gallery or Camera. ?Choose Jay Bhim frame according to yourphoto. ?Share your creations with friends.Jay Bhim Photo Framessuits your individual style and an excellent Photo frame candefinitely enhance the beauty of the picture it holds.FEATURES?Free and Easy to use .? User Friendly interface.? Add differenteffects to your photo.? 20+ Jay Bhim frames .? Share your editedimage to your friends or family members through social networksites ? Set saved image as your smart phone wallpapers.AwesomeFilters:-• We give you 50+ best filter effect for your photo.•There are lots up filter that you try like: Lomo, Hefe, Toaster,Earlybird, Hudsun, etc.• Make your image stylish by many filtereffect.Stylish Text:-• Add cool and stylish font to your Downloadthis photo editor app to find more features and lots • of readymade Jay Bhim Photo Frame..• Give your text to Color, Shadow, metalbackground etc.Sticker & Emoji:-• Doggy Face for switch yourface for free and create smiley Doggy Face.• Flower CrownStickers.• Emoji smiles will make your photos more fun. • Cuterabbit - ears - nose stickers to make your funny frame.Show yourlove to your loved one by putting photos in one of the remarkableJay Bhim photo frames. See how your friends respond to your new JayBhim photo frames.If you like Jay Bhim photo editor application, donot forget to leave your feedback for us. Photo Blender Editor is a best photo editor & blender effectapplication, help you have awesome photo collage from multi cutphoto you touch. With Photo Blender Editor, you can combine yourordinary photos to create beautiful collages. ♥ Photo BlenderEditor allow you to add text, stickers to your custom photos. photoblender app is a best photo blender to provide the square/collageand snap photo for instagram. photo blender app, Collage Maker,Mirror Image, blur image, splash image, scrapbook All In One! photoblender app, you can post full size photos on Instagram with nocrop, with blur,mosica background, shadow to emphasis you photo tobe art, with lots fantastic stickers. photo blender pic also helpyou combine multiple photos with various layout and photogrids,with hundred layouts,backgrounds,and you can adjust layoutsso make sensitive, in addtion to these,blur square size pic is theeasiest pic stitching tools out there. photo blender maker pic willcollage your 1-9 photos together. You can choose the collagetemplates and adjust the inner and outer . There are 100+ collagetemplates. ☆ Photo Blender App - The most popular and free photoblender worldwide - New content updated every week! - Createstunning photos for free - Amazing functions: Blender, Square BlurImage, Shape Effect, Scrapbook to create memo album, collage makerwith hundreds layouts, Mirror Effect. 【Main features:】 + CollageMaker: 300+ different collage templates for you to combine photosin different ways, you can even customize templates to suit yourneeds! Design your own photo creation! Anything is possible + Crop& Resize: Supports horizontal and vertical cropping &resizing. Crop & Resize your images in different aspect ratio +Filter: many amazing filters, including beautify, retro, landscape,halo, black & white and all sorts of festive filters. Bad orgood weather, you still can make photos better + post full sizephoto without croping, with blur background, shadow effects. +1000+ funny stickers for you. You can add your favorite emojis onphoto. + you can create splash image, blur image, square image withblur, mirror image with 3D effects, flare effect as well + you cancreate an image like scrapbook. + you can blend between two images+ Add the blur background for your photo + you can add text toimage + you can add sticker to your image + Filter, rotate, creatememo texts, blur, focus photos with photo blender + Collage maker:* Collage 1-9 photo together * 100+collage templates * Adjust theinner/ corner/ shadow/ scale * Add the amazing frames * Drag andDrop image anywhere you want + you can share created photo viafacebook, twiter, instagram, mail (ex: gmail, yahoo) + you canchange background of photo + save your photo created in HD mode,you can also choose the size to be saved. + if you're lazy, you canuse random button at top-right corner + support save images on SDcard (external SD card) + support over 80 languages + you can viewyour created images easily photo blender app is a powerful photomaker for you with photo editor function. Please share your photoand video with photo blender app to Instagram /facebook / twitter.photo blender app is all free and keep update, if you have anyfuture features or suggestion, please keep free to contact us:[email protected] You always welcome, download itfree and enjoy! Photo Blender Editor is a best photo editor & blender effectapplication, help you have awesome photo collage from multi cutphoto you touch. With Photo Blender Editor, you can combine yourordinary photos to create beautiful collages. ♥ Photo BlenderEditor allow you to add text, stickers to your custom photos. photoblender app is a best photo blender to provide the square/collageand snap photo for instagram. photo blender app, Photo CollageMaker, face changer, PIP camera All In One! ☆ Photo Blender App -The most popular and free photo blender worldwide - New contentupdated every week! - Create stunning photos for free - Amazingfunctions: Blender, Photo Collage Maker, face changer, PIP camerato create memo album, collage maker with hundreds layouts. 【Mainfeatures:】 + Collage Maker: 300+ different collage templates foryou to combine photos in different ways, you can even customizetemplates to suit your needs! Design your own photo creation!Anything is possible + Crop & Resize: Supports horizontal andvertical cropping & resizing. Crop & Resize your images indifferent aspect ratio + Filter: many amazing filters, includingbeautify, retro, landscape, halo, black & white and all sortsof festive filters. Bad or good weather, you still can make photosbetter + post full size photo without croping, with blurbackground, shadow effects. + 1000+ funny stickers for you. You canadd your favorite emojis on photo. + you can create splash image,blur image, square image with blur, mirror image with 3D effects,flare effect as well + you can create an image like scrapbook. +you can blend between two images + Add the blur background for yourphoto + you can add text to image + you can add sticker to yourimage + Filter, rotate, create memo texts, blur, focus photos withphoto blender + Collage maker: * Collage 1-9 photo together *100+collage templates * Adjust the inner/ corner/ shadow/ scale *Add the amazing frames * Drag and Drop image anywhere you want +Face changer features: * Alien * Fisheye * Frankenstein *Terminator * Anime * Blockhead * Chipmunk * Chubby * Crazy smile *Elephant * Fat * Grimy * Joker * Nosy * Round * Sad * Skinny *Stretch + you can share created photo via facebook, twiter,instagram, mail (ex: gmail, yahoo) + you can change background ofphoto + save your photo created in HD mode, you can also choose thesize to be saved. + if you're lazy, you can use random button attop-right corner + support save images on SD card (external SDcard) + support over 80 languages + you can view your createdimages easily photo blender app is a powerful photo maker for youwith photo editor function. Please share your photo and video withphoto blender app to Instagram /facebook / twitter. Picture Frames Collage This Pic Collage Editor allows you to createphoto collages using your photos,images,funny stickers,backgrounds,overlays and colorful text. It helps you to group orcombine multiple photos into one frame with various effects andframe styles. This photo editor is packed with framecollections,templates,grid and stickers that create a professionalphoto collage instantly. Its a big collection of frames and shapes.If you enter the app, there are too many collections of photocollages to choose for. You have to divide this frames by clicking"Categories" as single,double,triple or shapes. You can set asfavorite frame by long click on it. App Features: ★ Unlimited photocollage collection ★ Classic,Cross and Shapes collages ★ Creativecollections of backgrounds and overlays ★ Easy to change boardercolors and backgrounds ★ Colorful stickers ★ Amazing photo filters★ Boarders and Photo effects ★ Text with customized fonts andcolors ★ Save,share and set as live wallpaper options ★ Easy anduse friendly interface.Please give a rate,comment and encourage usto develop more free games and applications. CB Background Provide Free images for Editing photosBackground,PNGs and more...Now Get New Images DailyNow CB EditBacgrounds Has More Than 1000+ Photos.Enjoy CB Background is usedfor any Photo Editing Application Purpose.This app Provide Freeimages and you can Save it to your GallaryFeaturesSave Images togallery DirectlySet WallpaperCan Use for Photo Editing PNGsPhotoyou can add your Collection to Favorite Categories>CBEdited Background>Name Fonts PNGs>Hair Style PNG>tattooPng>Shoes PNG>Backgrounds • Enjoy a collection that keeps ongrowing.• Double your fun. • Start each day fresh. PermissionsNotice Photos/Media/Files: Needed to allow you to use custom photosas wallpaper. Storage: Needed to allow you to use custom photos aswallpaper.Copyright : All copyrights belong to their respectiveowners.Images and text owned by other copyright holders are usedhere under the guidelines of the Fair Use provisions of UnitedStates Copyright Law. jay bhim Photo Frames is best photo editor to decorate yourphotos.Photo Frame is a powerful collage maker for you to createamazing photo frames using your photos, text with cool fonts andframes.are you ready for decorate your photo with jay bhim photoframe?its simple to work with this jay bhim photo frame and createincredible and gorgeous photo with multi frames. simply your photoand edit your photo with best multi frames and many more. jay bhimphoto frame editor has a very simple user interface, everybody canuse, with a powerful photo editor.Choose photo from Album andselect a frame and generate your photo frames.Enjoy the best photoframes in App Store.Using this app you can make photos morebeautiful by decorating them with fantastic free jay bhim photoframe, effects, text and stickers. More Features:- Select a photoor picture from gallery or capture it with your camera phone inreal time.- Create a professional Photo Frame instantly.- Afull-featured photo editor included.- Multiple stylish nature photoframes for any picture.- Simple touch gestures to rotate, resize,double tap to delete- Simple and powerful user interface helps youto get job done much quicker.- Gorgeous , stylist and Hd jay bhimphoto frames.- Give different effects to your photos with jay bhimPhoto Frames app- Give different effects to your photo.- Easy toadd TEXT or STICKERS!- HD quality jay bhim frames.- Stitch picstogether within a few taps!- Make your photo more effective andcreative with unique shapes.- A lots of jay bhim templates tochoose from, fit for any occasion.- Multiple Water Fall PhotoFrames available.- Rotate, scale, zoom in, zoom out or drag thephoto to fit the frame as you like.- Give different effects to yourphoto.- this photo editor app Makes you a celebrity.- this photoeditor app is completely free download.- Nice and colorfulstickers.- Save your image to SD card.- Share your creation viasocial media FB/Watsapp/Insta. "All In One Photo frames" You can get all type of photo frames withthis application such as classic,photo collage, frames and photoshapes..You can edit the photos with color effects and filters..add colorful stickers and text for photos and create photocollages..CLASSIC Take photos from gallery, camera and create photocollage or album, add boarders with colors and thicknessPHOTOCOLLAGE In this page you have 4 type of photo frames that yourselection such as single, double, triple and quad frames. You canfit your pictures on it and add stickers and text.FRAMES Here, youcan select individual photo frames and insert photos in it, placeit with rotate and moving on a beautiful hd backgrounds, which isalready included with this application. In this you can createphoto albums with multiple photo frame selectionsSHAPES Here, Youcan crop the selected image with different type of symbols likeround,oval,love shape, Butterfly and many more etc.. You can givethe boarder with colors to get beautiness for the frames.. You cancreate albums with multiple photo shapes.. So you can stopsearching for different types photo frames application with thisone..Please support us with your ratings,comments and encourage todevelop more free applications and games..